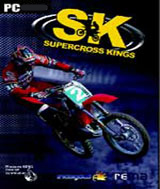 Gamers get to choose their own team as they travel the motocross circuit and ride in 12 different arenas in SuperCross Kings. Work your way through the skill levels from rookie to pro as you compete against up to 18 other riders. As skill level improves, riders can try their hands at some of the most spectacular tricks imaginable, but they´ll also have to look out for some of the most spectacular pile-ups too.